As I get older, I can see that I write the same poems over and over, that each poem is a new way of seeing and exploring the same paths. Each poem is just a variation on a theme. who called me about the lamb caught in the fence. in the mesh of nylon and fine wire. Martha Treichler is a retired teacher of English and French, and a retired Registered Dietitian. She has a BA from Goddard College, and an MALS from Dartmouth College. She and her husband Bill were enthusiastic students of history, and published the Crooked Lake Review, a journal of the history of Upstate New York, from 1988 until Bill's death in 2008. She also writes history articles for the Echoes, the quarterly journal of the Steuben County Historical Society, and has published Stories of Mt. Washington, a history of the hill in Steuben County, N.Y. where she and Bill bought a farm forty years ago. I have always lived on an old dirt road. I was born on an old dirt road. That turned to lovely mud, on our old road. 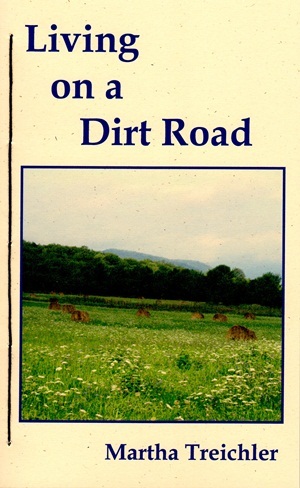 On a dirt road I met the boy I wed.
We were married on an old dirt road. We have always lived on a dirt road. Neighbors can be pushy on a dirt road. Two skunks set up housekeeping under our porch. We relocated them to the closest wood. Two possums took the empty flat. Barn swallows settled under the porch roof. to be handy to the buckeye when its tall candles lit. But never shared the work. that write the contrails in our sky. And the grass still grows in the center of the road. Martha Treichler is a retired teacher of English and French, and a retired Registered Dietitian. She has a BA from Goddard College, and an MALS from Dartmouth College. She and her husband Bill were enthusiastic students of history, and published the Crooked Lake Review, a journal of the history of Upstate New York, from 1988 until Bill's death in 2008. 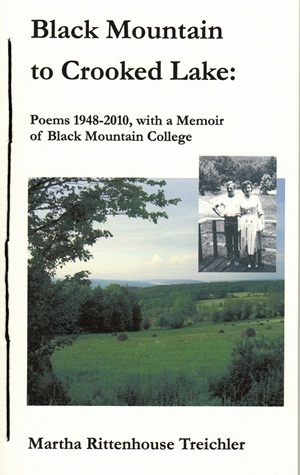 This is her second book of poems published by FootHills Publishing; the first was From Black Mountain to Crooked Lake, which includes poems from her days at Black Mountain College, where she studied with Charles Olson. Martha Rittenhouse Treichler is not going to leave us without passing on some of her wisdom and age. At fifty she writes “That now I welcome every crease and pain/That age has brought, because I love the way/They worked to teach me for my richer gain.” This whole book celebrates teaching and learning as life-changing motivation and inspiration. At eighty the images are of rest and friendships, “The wood is stacked; the kettle steams,/There's a meaty breath from the soup in our bowls.” You can catch some of the joy in a long life well lived. I look forward to the next book by Martha Rittenhouse Treichler. Who knows how many Martha Rittenhouse Treichlers passed through Black Mountain College (I'd usually say halls, but I've got a feeling there weren't any)? We might forget that generations before the dissent, free speech and love, and Diggers of the sixties, Artistic Freedom, Equal Rights, and Back-to-the-Land were alive and well in America. Martha Treichler's poems and essays give us a glimpse of this world, crystallized in the Forties at Black Mountain College. Even more remarkable, Martha Rittenhouse added Treichler to her name, began a family, and they all ventured down the road less traveled, teaching, writing, and organic farming all through Iowa, Colorado, and Vermont, before settling on land in New York's Southern Tier. This book is an extraordinary document-a fine record of life at Black Mountain, and a life beyond that experience. 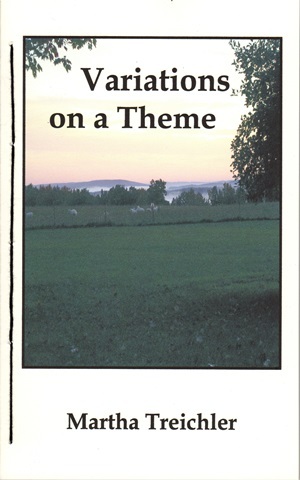 Included are prose reminiscences of classes Martha took with Charles Olson and Edward Dahlberg, poems written for Olson's class, with helpful contextual notes, a historically significant letter, previously unpublished, from Olson to Martha, along with a poem he gave her co-authorship on. Some of Martha's own early poems are what might be called “student poems” or preliminary explorations of form, but others, like “Conversations Familial,” “Wet Leaves Don't Rustle” or “7 pm,” are remarkably mature works. Also included are poems written after leaving Black Mountain, some in recent years. I'm especially fond of the “Old Woman's Sonnets,” where she is out from Olson's shadow, or anyone's, and free to record a life-as-lived in unpretentious, object-rich language, like The night grows older and colder. I'm glad / For my book, my cup, my couch, and warm plaid. The Black Mountain experience has been an enduring presence in the lives of Bill and Martha Treichler. Friendships with teachers such as Natasha Goldowski and her mother lasted their lifetimes. For Martha, focused-writing was set aside for years as children, homemaking, and work were all-consuming. Still she continued to write when she could. In 1988, Bill, who died in 2008, and Martha started The Crooked Lake Review, a local history journal. Although for many today it is the luminaries at the college who have captured their imagination, for the students the magic was in the integration of living and learning in the small intense, interactive community. Martha Rittenhouse Treichler recalled that she was happy every minute at Black Mountain College. and Director of the Black Mountain College Project. I came to Black Mountain College in the Fall of 1948, and left the next June at the close of the year. Since it was a long way back to Maryland, I spent Thanksgiving at the college, along with a few other students. I enjoyed every minute of my stay at Black Mountain College, and if I had had the money, I would have stayed on indefinitely. During his writing classes, we took turns reading our poems and sketches aloud, to be praised or scorned by the rest of the class. Olson made time for work sessions outside of class, too, when he would let us bring poems and sketches for him to evaluate. He was specific. I remember a poem where I had said, “the song of the frogs is of ecstasy”. He told me flatly that ecstasy was an over-used word, and could mean anything, and so was meaningless. He told me to slash it from my poem, but he said that he liked the phrase “streams and lanes” in the same poem, because it was a fresh use of words. He taught us that insight must precede writing, that writing is an exercise of the mind, not the hand. At night, when we were through with our studying or partying, we had to go back to our dorms from the Studies Building on a dirt road in the dark. I usually imagined that a sleepy snake was curled up on the warm road, waiting for me to step on it, and ready to strike. So, I ran as fast as possible every night. This poem came to me on one of my runs.